This month the Unique Women in Business team is doing a Blog Hop focused on Summer Fun. With temperatures in the 90s (some close to 100 degrees) and dew points in the 70s it feels like it’s quite tropical here in Minnesota. For me, having fun during the summer means having some flexibility to do things I enjoy doing since the homeschooling schedule is a bit more relaxed compared to the September-May time period. Window star in summer colors. Window stars are available in my shop, Harvest Moon by Hand. The window star that is pictured above reminds me of sunsets and sunrises in colors I typically see in the summer. There have been some spectacular ones that have colored the entire sky in shades of these colors. I am always in awe of the incredible natural beauty that surrounds me. Today, I was teaching a friend of my daughters how to sew since she wants to learn how to make her own clothes. The first project I had her do was a little bag with an attached tie. There were no measurements for this pattern – it was simply an idea presented in a book. So I showed her how to estimate and create the dimensions for each of the pieces. By the time she was done sewing her first bag, she had learned some fundamental sewing skills…and felt very happy with what she made. After seeing the bag (and trying out the pattern I’ve wanted to do for some time now), I made a couple of bags after she left and changed the proportions slightly. Two bags that I made. The bags are a great way to use fabric and ribbon scraps. I’ve made re-usable gift bags using only one color of fabric for birthdays and Christmas. As I made these bags, I thought they would be good to use for the girls in their backpacks or when traveling. By making the bags in a variety of different sizes and patterns, one’s suitcase, purse, or backpack could be much more organized. Last, having fun during the summer means being able to enjoy nature up close. Today I enjoyed watching a bird take a bath in the birdbath in the backyard. For several minutes, it cleaned its feathers…tossing the water in the air and under its wings. That, in itself, would have made me happy today. But…I woke up this morning and found that two of the butterflies we’ve been raising since they were caterpillars had emerged from their cocoons. Around 11:25 a.m., the third butterfly was born and we were able to watch its wings unfold, dry, and be strong enough to fly. What an amazing process! After lunch, we released the butterflies in the backyard. The black tiger swallowtails flew off immediately. One flew right to the purple flowers in the butterfly garden in the backyard where it visited lots of flowers while its wings beat quickly. (thus, the picture is blurry on the top). change from caterpillars to butterflies during July. Outside my window…there’s a clear blue sky. The pine trees are still after swaying back and forth last night during the thunderstorm. I am thinking…about how nice the cool air felt this morning when I let the dogs out. After a heat index of over 100 degrees over the past couple of days, this is a welcome relief. I am thankful…to have been able to spend part of my birthday with my sister. We enjoyed a morning of strawberry picking with Sophia and Olivia, and then visiting a buffalo farm where we all enjoyed a nice lunch together. From the learning rooms…the girls and I had a fun week focusing doing the “Smart Summer Challenge.” This week’s theme was “Me on the Map” – so everything we did we looked at from a geography angle – whether it was embroidery, paper cutting, 4-H projects and demonstrations, or visiting different farms. In the kitchen…I have two flats of strawberries that will are being eaten fresh. Later today, I’m going to try some new recipes – for strawberry-lemonade; a salad with strawberries, asparagus, and walnuts; and a strawberry pie. I am wearing…a hooded sweatshirt and pajama pants. It’s still early morning and no one is awake yet…except some of the cats. The dogs went back to bed after going outside. I am creating…items for The Summer of Color. I just found out about this ten-week blog party this morning, and am excited about it. I’ve been doing more writing and less creating than last year, and want to get back into doing more of the visual arts/crafts again. Having a weekly challenge focused on a particular color will be a good motivator to start creating again. I want to catch up and do the first three weeks (the colors for each week are blue, green, and pink); while working on the fourth week (July 4th-11th). Yellow is the focus for the fourth week. I am going…to visit my mom and dad this morning. Sophia, Olivia, and I will be going out to breakfast with them (they are both home-bound so it’s going out to eat is something they enjoy). We’re going to help weed their vegetable garden, clean the carpets in two rooms, and replace the batting in a quilt I made for my dad many years ago. I am wondering…when I’m going to sit down and figure out the schedule for next year for homeschooling. I want to use many of the books and resources I have on hand this year rather than buying as much new curricula as I have done in the past. As much as I like Sonlight (which I’ve used for the past few years), it is quite expensive. Perhaps picking and choosing from Sonlight and supplementing it with what I already have will be the best route to go during the 2011-12 school year. I am reading…Twisted Tree by Kent Meyers but didn’t like it. After 92 pages, I just couldn’t get into the book. I found it to be a rather grim book. There was a review in a book for book clubs, and it sounded intriguing as did the discussion questions. However, from the onset, the book was more on creepy than what I wanted to read. I am hoping…that the lawn mower comes back soon. It has been at the repair shop now for over a week and the grass is getting really long. I am looking forward to…bringing a couple of peonies and tiger lilies indoors today, and putting them in vases. I’m going to help my dad (who has Alzheimer’s Disease) cut some flowers that are blooming at his home, and put them in vases as well. He use to cut flowers during the summer and bring them in for my mom and him to enjoy. I am hearing…the fan. Not much of anything else. It’s very quiet and peaceful at this time of the morning. Around the house…I’m getting projects done that I’ve wanted to get done for some time now. I went through a basket of “to do” projects and did them as I went through the basket. No putting them aside to work on later. I either did them, helped the girls do their projects, or put them in the donation bag. Yesterday, I did mending, sewing, and needlefelting. I helped Olivia with another embroidery project; and Sophia with sewing a dress and an embroidery project. I am pondering…how nice it was to see several friends during the past couple of weeks, and how I need to make time to stay connected with people. It’s so easy to get wrapped up with caregiving that other aspects of my life are put on hold. One of my favorite things…seeing all the baby toads that the girls have been finding, observing, and then releasing. It’s also been so nice to hear the wren singing every day, and watching the parents bring food to their babies. There are three wren families here this year which is great. I saw a monarch yesterday in the butterfly garden yesterday (it always makes me happy to see butterflies). A few plans for the rest of the week…visit my parents (today), celebrate the Fourth of July (Monday), take Sophia to harp lessons (Tuesday), take my dad to his quarterly doctor appointment for Alzheimer’s Disease (Thursday), do fun/educational activities related to the theme of “government” with the girls, and start some creative projects this week focused on different colors (most likely doing quilting and embroidery). Here is picture for thought I am sharing…this is an eastern tiger swallowtail butterfly that Sophia, Olivia, and I saw on Thursday morning. We stopped for a bit at a lake before Sophia’s harp lesson. As we were walking back from the lake, this butterfly was drinking some water from the road and then was flying around us at eye level. It spent quite a while flying and landing around us. It was a beautiful butterfly, and the photograph below doesn’t do it justice. Nonetheless, it captures a few moments in time that were memorable to us. flying and landing right by the girls and me. To see other people who are participating in the Simple Woman’s Daybook during June, please click HERE. So, that’s what we did today…on my 45th birthday. 1. The challenge is to have a picnic. No need to go far or to even have a picnic table. Food always tastes better outside and if you don’t want to commit to a whole lunch, why not just a snack? 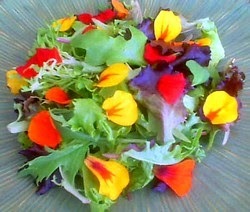 “…When the weather is warm, why not eat breakfast and lunch outside? We ended up having a light dinner and dessert outside on the little deck. The girls brought out pillows and blankets to sit on. Olivia and Sophia having dinner on the deck. Sophia bringing out the French silk pie. After you eat, sit and listen to the sounds of nature. influences the general quality of family relationships. We listened to nature before we ate and at times while we were eating. The birds were singing (especially the wrens who have a nest near the deck), the swallows were flying around the backyard and then under the eaves of the barn, and the wind was blowing lightly. It was a beautiful night to have a picnic. The pine tree next to the deck and back of the house. It is now taller than the house. We spent some time looking at the vegetable/herb garden, flower garden, strawberries, and clover – all of which are subjects of other nature studies that we have done/are in the process of doing during the upcoming day or so. The first tiger lily of the season bloomed on the 29th of June…my birthday. 2. After your picnic, spend 10-15 minutes observing your surroundings. Add anything new to your list of items observed in your focus area that you are keeping in your nature journal. Make note of any additional research that needs to be done for things your child is interested in. Make a journal entry if you wish. We didn’t spend time after the picnic outside because the mosquitos were getting progressively worse. The girls get rather significant reactions to mosquito bites, so it was better to go inside at that point. The girls are interested in the tiny toads that they have been finding. At 1/4″ long, they are very small; in fact, the smallest we’ve ever seen here. Outside my window…it’s still dark. However, the first hint of morning is showing to the east where the sky is a lighter shade of indigo. 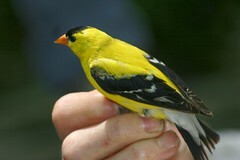 I am thinking…about the male goldfinch who kept trying to get into the house yesterday. He kept flying to and grabbing onto the ledges by the living room and kitchen, and visited the family room and dining room windows as well. The cats were fascinated by this bird who seemed equally as interested in them. Wonder if he’ll be back today. I am thankful…that a respite worker is coming today for three hours. I need to have a few hours to get some things done; and I like knowing that Sophia and Olivia are having fun with Mary. She’s taught them how to play croquet; and they enjoy playing board games and being outside with her. From the learning rooms…the girls are getting ready for the county fair and showing some projects they’ve been doing for 4-H. They’re also practicing their demonstrations (this will be the first year for both of them). Went to the zoo the other day and learned a lot about different animals and Japanese gardens/tea ceremonies (the zoo has a conseratory and Japanese garden which are both beautiful). In the kitchen…we’re going to be making fresh strawberry pie on Saturday which we’re excited about. Fresh strawberries are finally ready to be picked. Making a few salads this week using lettuce and herbs from the garden; and trying some more beverages using fresh seasonal fruit (rhubarb and strawberries) combined with homemade lemonade. I am wearing…a hooded sweatshirt and pajama shorts. It’s still early morning and no one is awake yet…except some of the cats. The dogs went back to bed after going outside and having breakfast. I am creating…a window star for a customer later on today. Have been helping Sophia and Olivia with embroidery projects. This year I haven’t done as much embroidery and quilting as I did last year. I want to start doing that again. I am going…to the grocery store today to get some ingredients for food I’ll be making for friends and family who will be visiting during the upcoming week. Have 3 visits scheduled for the next week – two of which are with people I haven’t seen for a long time. Saw a friend who I’ve known since the late-1980s on Monday. It’s been nice re-connecting with people again. Seems like a lot of time has been focused on caregiving and homeschooling recently. I am wondering…how I’m going to get the yard and gardens looking more presentable before Saturday’s guests and Monday’s 4-H club tour (with one of the stops here). Between cleaning the house and the rain, I haven’t had as much time as I’d hoped to work on the gardens. I am reading…Another Place at the Table – A Story of Shattered Childhoods Redeemed by Love by Kathy Harrison which is an incredibly good book about a woman who was a foster parent to more than one hundred children. Read 14 chapters yesterday morning…couldn’t put the book down. Will be starting another book this morning – All That Matters by Jan Goldstein. I am hoping…that my back pain goes away today…or at least diminishes a bit. I am looking forward to…looking at pictures I took earlier this week. I enjoy looking at pictures and remembering what I saw or experienced. I am hearing…Gretel (the dog) taking a deep breath. The fan. Quiet. Complete peacefulness. Birds singing outside…the wren already singing away at 5:20 a.m.
Around the house…everything is off the carpeted floors since I spent the majority of yesterday vacuuming all the floors and then deep-cleaning them with the carpet cleaner. They look so much better this morning. Almost don’t want to put anything back down. I am pondering…the impact that Alzheimer’s has had on my dad over the past year. I looked at some pictures yesterday from last summer and it’s amazing the effect the disease has had on him in just one year. I am so thankful that he still knew who I was on Father’s Day…but there were some times when he looked at me with blank stares (which I’ve never seen him do until Sunday) that were quite sobering and sad. One of my favorite things…watching the wildlife here. Enjoyed watching the goldfinish yesterday; listening to the baby wrens chirp whenever one of the parent wrens brings in food; seeing the woodpecker at the hummingbird feeder; watching a robin take a bath in a big puddle in the driveway; and seeing a huge rabbit jump in the backyard and hop to the hostas under the apple tree. A few plans for the rest of the week…getting ready for guests on Saturday, Monday, Tuesday, and Wednesday (each day are different people/groups of people). Going to an event that celebrates summer at a local historical museum. 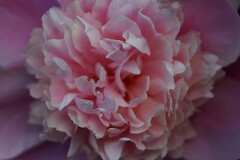 Here is picture for thought I am sharing…of one of the peonies that are blooming. These are ones that have been here for well over 15 years. The Chinese peonies (that I planted a few years ago) just started blooming this year. They’re a beautiful shade of red with yellow centers. This week we focused on the Outdoor Hour Challenge Spring Series #3: Spring Bird Study that is at the Handbook of Nature Study website. As part of our spring nature study this week, we will prepare by learning about some familiar bird songs. Read about the “Songs of Birds” in the Handbook of Nature Study on pages 42 and 43. In most cases only the male bird sings, but a few exceptions are recorded…the female rose-breasted grosbeak and cardinal grosbeak, which sing under some conditions. Birds do most of their singing in the early morning and during the spring and early summer months. Some ornithologists have developed complicated systems of recording bird songs as musical scores. Wilson Flagg and F.S. Mathews are well-known names in this field. Such a method has its limitations because many variations of bird songs cannot be indicated by the characters used in writing music. The song of the warbling flycatcher. The song of the green warbler. The song of a bird written as music is not usually recognizable when played on a musical instrument. Here is a link to a page that will help you learn about to listen to and then identify birds by their calls: Songs and Calls. This link has wonderful examples of bird songs divided by rhythm, pitch, tone, and repetition. Sophia, Olivia, and I were able to watch how this was done. Brainstorm a list of birds you know that live in your area. Pick two or three to research on the All About Birds website. Look up each bird and listen to their bird songs. Challenge your children to imitate the bird song and to listen for it when they go outside. Sophia picked the following birds that she wanted to listen to their songs: pheasant and house wren. We hear both of these birds regularly in the yard and pasture; and hear them on our nature walk for the Spring Bird Study. one of our feeders. 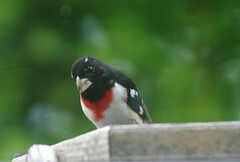 The grosbeaks have a beautiful song. Spend your 10-15 minutes of outdoor time this week looking and listening for birds. You might try going out several times during the week at different times of day to listen and observe. This will be a week you can work on a few minutes of quiet time while you are in your backyard or local park. Remind your children that if they are quiet even for one minute they might hear a bird or other animal. One minute can see like a lifetime for young ones so use your good judgment on this activity. every time they hear a bird song. We spent time outside in our backyard since there is a variety of birds that regularly visit us each day. We walked to and then stood in different locations (e.g., deck, by the apple tree, by the pine trees in the backyard, and several places on the nature trail). One of the things Olivia mentioned was that she heard so many birds singing all at the same time. One would start and then another and another. “I couldn’t tell the old birds from the new birds.” It did sound like – a constant symphony of birds singing and calling to one another. As we listened to the birds, there were some that were easily recognizable and we knew their songs and calls: red-winged blackbird, mourning dove, house wren, American goldfinch, and pheasant. However, for the majority of the bird songs and calls we were hearing, we couldn’t identify which bird was making the sound. Take a few minutes to follow-up on any interest that came from your outdoor time even if your children were interested in something other than birds. We were noticing that a lot of milkweed is starting to grow now throughout the nature trail area and backyard. I flipped over a milkweed leaf and saw a tiny yellow ball. The girls and I are hoping that it is an egg. So, we brought the leaf in and it is in the butterfly observation holder. that’s on the underside of a milkweed plant. We also were happy with the gentle rain that fell the night/early morning before our nature walk. Temperatures had reached over 100 degrees during the week, and there had been no rain recently. Having rain – without the thunder/lightening and hail – was a welcome sight and sound. Review the bird songs you learned and practiced during your preparation work. If you saw an unfamiliar bird, try to identify it using a field guide. Learn more about identifying birds here on this page: Bird Identification Skills. If you do not have a field guide, you can try this online bird site to help identify birds: WhatBird? And this website for additional information as well: AllAboutBirds. We tried to identify the bird above since it was pretty far away from us and we didn’t have binoculars with us. It had a small crest on its head which seemed more pronounced when it sang. When we came back indoors, Sophia looked at the Minnesota bird book and found one that looked similar to what we saw: Tufted Titmouse. The name means “Small Bird,” and comes from Scandinavian and Old English words. However, looking at more pictures of this bird on the internet, led us to believe it may be another bird (perhaps the feathers on the bird’s head just moved so they looked like a crest when it sang). Looking at the picture of the bird we saw, we noticed it had a spotted chest and was more brown in color. Looking athe Minnesota bird book again, we found the female rose-breasted grosbeak which looks just like the one we saw. Don’t forget to look up any birds you identify in the Handbook of Nature Study and see how Anna Botsford Comstock suggests you learn more about that particular bird by reading the narrative and the accompanying lesson. Allow time for a nature journal entry. You can print the pages from a coloring book, complete them, and then adhere them into your nature journal or you can use the black line drawings as a guide to sketching your bird directly onto your journal page. After the walk, the girls worked a bit on their nature journals. They wrote the names of some of the birds they heard and recognized and counted the number of songs they heard. Sophia wrote a brief description of the walk and what the day was like (e.g., cool, cloudy). Looking to the southwest from the nature trail. I ordered a book from the library that should arrive soon. It’s called The Music of Wild Birds: An Illustrated, Annotated, and Opinionated Guide to Fifty Birds and Their Songs by: F. Schuyler Mathews and illustrated by Judy Pelikan. Mr. Mathews was referenced in the Handbook of Nature Study. What intrigued me about this book is that the description said, “As Mathews points out, the music of wild birds is everywhere – in poems, children’s nursery songs, as well as in the works of the great composers: the Black-billed Cuckoo’s call appears near the close of Beethoven’s Pastoral Symphony; the Nashville Warbler’s song is found in the opening bars of Rossini’s Carovale, and the Meadowlark’s song is remarkably like the first two bars of Alfredo’s song in La Traviata. 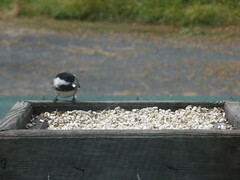 A black-capped chickadee at the feeder. We hear the chickadee singing almost every day.